A much worn carved stone, or Pictish cross-slab, possibly of 9th-century date. What we see today is only a fragment of the original stone, decorated with faded carvings. Historic Scotland, who look after Dogton Stone, describe it as a free-standing cross, but that interpretation is somewhat open to debate. The stone bears a faded carving of a cross in Celtic style, with several worn Pictish symbols, among which may be a rider on horseback and interlaced serpents. Dogton Stone may commemorate a battle between the Picts and Scots, or, alternatively, a battle between Constantine and the Danes. What we see today is just the base and bottom of the cross-shaft. The stone stands on its original spot, though why it was erected here is open to interpretation. It could mark a ceremonial centre or religious site, or perhaps mark the boundary of a territory or a roadway. The 9th-century date makes the Dogton Stone a late Pictish carved stone, from a time when the Picts were moving from pagan beliefs to Christianity. It is one of only a few known free-standing Pictish crosses. 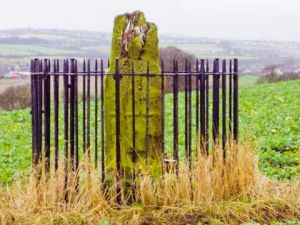 The Dogton Stone stands in a farm field, protected by an iron fence. Because it is on private property there may occasionally be limited access. 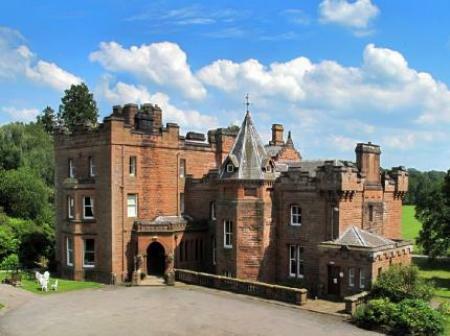 The stone can be found at Dogston Farm, 1.5 miles east of.Cardenden rail station off the B922. Location: It can be hard to find the Dogton Stone as it is not signposted. Take the lane off the B922 to Dogton Farm, 1.5m East of Cardenden railway station. The stone stands in a field to the south of the farmhouse, enclosed by railings. An OS map is essential!